I fixed another mess of the Crappie tonight! 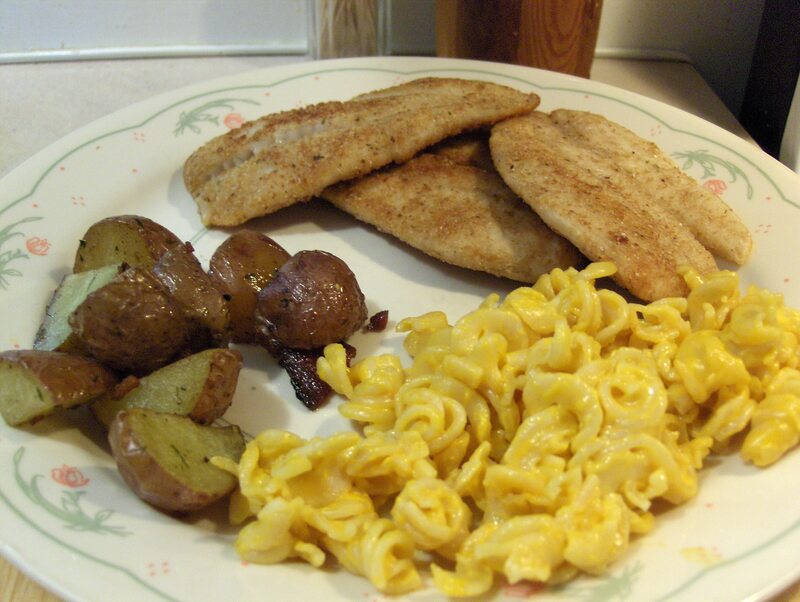 I never get tired of eating Crappie. I seasoned them with Sea Salt and Ground Black Pepper. I then rolled each fillet in a Whole Wheat Flour and Italian Bread Crumb Mix. I lightly fried them in Extra Virgin Olive Oil about 3 minutes per side. As usual they fry up to a golden brown and absolutly delicious! For sides I made some Roasted Red Potatoes, recipe is at the end of the post, Kraft Veveeta Whole Grain Rotini & Cheese, and Healthy Life Whole Grain Bread. 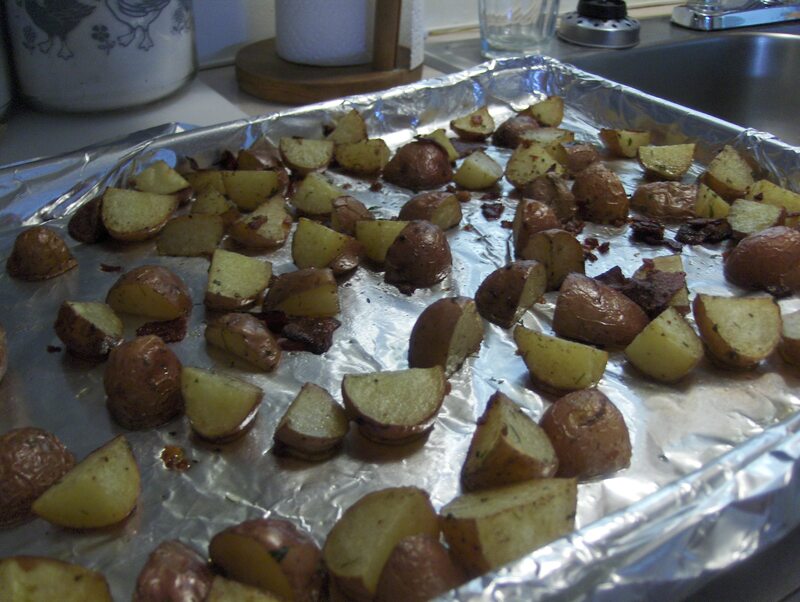 if your looking for a good and simple Potato recipe give this one a try! These would make an excellent Potato dish for breakfast also. For dessert later a slice of Pillsbury Nut Quick Bread topped with a scoop of Breyer’s Carb Smart Vanilla Ice Cream. *HEAT oven to 400ºF. Cook Turkey Bacon in large skillet on medium heat until crisp. Remove bacon from skillet, reserving 1 Tbsp. drippings in skillet. Drain bacon on paper towels. *ADD potatoes to reserved drippings; cook 5 min., stirring occasionally. Remove from heat. Crumble bacon. Add to potatoes; mix lightly. Spoon into 13×9-inch baking dish. *BAKE 20-30 min. or until potatoes are tender and done. Top with cheese and parsley. It was spaghetti night tonight! 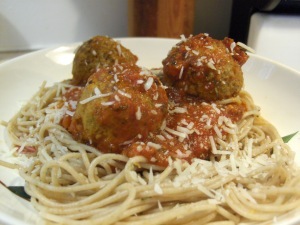 I used Ronzoni Healthy Harvest Whole Wheat Spaghetti along with Honeysuckle White Turkey Meatballs. Topped everything with Shredded Parmesan Cheese and Bella Vita Low Carb Pasta Sauce (Meat Flavored). 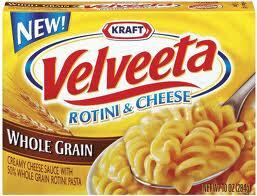 Along with the great taste the Sauce is only 70 Calories and a mere 6 Carbs! I also had healthy Life Whole Grain Bread that I buttered and then sprinkled with Shredded Parm Cheese. Then I baked it at 350 degrees for 7 minutes. Makes a good side for any Pasta dish. For dessert/snack later some Chip‘ins Popcorn Chips along with Athenos Roasted Red Pepper Huummus. Love these Burgers! I need to have them more often. Had a Pineapple Teriyaki Turkey Burger. I used Honeysuckle White 93% Lean Ground Turkey. Topped it with a slice of Pineapple, that was added during frying, and reduced Mayo w/ Olive Oil mix. Seasoned with Sea Salt, Ground Black Pepper, Fresh Ginger, and Pineapple Juice reserved from the can of Pineapple Slices. Served on Healthy Life Whole Grain Sandwich Buns. Had sides of sautéed Mushrooms. The recipe calls for grilling the Burgers, I used a Grill Pan and cooked them indoors (Only 36 degrees out!). Recipe follows. It was easy comfort food Monday for dinner. A Grilled Cheese and Tomato Soup can’t be much easier or filling. Used Aunt Millie’s Whole Grain Bread, Kraft 2% Sliced Sharp Cheddar Cheese, and I Can’t Believe It’s Not Butter (For frying) for the sandwich and Campbell’s Creamy Tomato Soup. Low Calorie, low Carb and quick and easy to make! Today’s Menu; Prime Rib w/ Potato Pancakes and Whole Grain Bread. Purchased some fantastic tasting Prime Rib from Sam’s. Baked at 400 degrees. Made up some potato pancakes and had Aunt Millie’s Whole Grain Bread. First time we purchased Prime Rib from Sam’s and it will not be the last! It was one of the best tasting and tender Prime Ribs we have ever had. Today’s Menu: Herb Crusted Chicken w/ Mushroom Risotto and sliced Whole Grain Bread. Then just follow the easy directions and you have a complete meal! The meal is 300 Calories and only 24 Cabs! I had Aunt Millie’s Whole Grain sliced bread with the meal also. Ham and Swiss Melt with…. Today’s Menu: Ham and Swiss Melt w/a Cup of Potato Soup. It was comfort Dinner tonight! Had a Ham and Swiss Melt w/Turkey Bacon. I used Aunt Millie’s Whole Grain Bread along with Oscar Mayer Deli Fresh Smoked Ham (98% Fat Free), 2% Alpine Swiss Cheese, Turkey Bacon, and Kraft Mayo w/Olive Oil. Took less than a half a pat of Butter (I Can’t Believe It’s Not Butter) and melted it in a 9 inch skillet, assembled the sandwich with each ingredient and toasted both sides of the sandwich over Medium Low heat. Served with a side of Campbell’s Potato Soup, added Parsley. Light and filling. Today’s Menu: Good Earth Spicy Citrus Glazed Shrimp w/Harvest Grain Loaf Bread. Fixed some more of the Good Earth Spicy Citrus Glazed Shrimp! Tooo Good! Comes with the Whole Grain Angel Hair Pasta and baked a loaf the Harvest Grain Loaf Bread. Today’s Menu: Baked Salmon Fillet w/Brown Rice, Boiled Mini Carrots, and Whole Grain Italian Loaf Bread. Had a beautiful Salmon Fillet from our local Meijer Store. Baked at 400 degrees for 15 minutes, it was rubbed with Extra Virgin Olive Oil and seasoned with Sea Salt, Ground Pepper Corns, and Parsley. Served with Brown Rice, Boiled Mini Carrots, and baked Whole Grain Italian Loaf Bread.